N-ethyl-pentylone (aka BK-EBDP or Ephylone) has caused problems before where it has been sold as MDMA due to the identical visual appearance but it’s rare in ecstasy pills. It seems like a small pill producer has been duped by a bulk seller and bought a batch to make into pills which are currently being sold in the Balearic Islands and possibly elsewhere. The alert has been released by Energy Control who received the sample on 5th April 2018. The tablets are white or yellow in the shape of a sheild with the Ferrari logo. The press quality appears quite poor and the images suggest the pills are not as hard as others on the market. It is likely that the manufacturer was trying to replicate other pills with this logo which have been sold at various times for the last six years. The mis-selling of pentylone and its analogues is particularly insidious because the effects are initially quite similar to MDMA itself, but the empathogenic effects are not so pronounced and the euphoria fades more quickly. This leads people to redose, but redosing seems to disproportionately extend the time to clear the body and this makes sleep very difficult or impossible for up to 36 hours without further medication. This stimulated sleep deprivation is horrible at best, and in some cases can even lead to temporary psychosis. 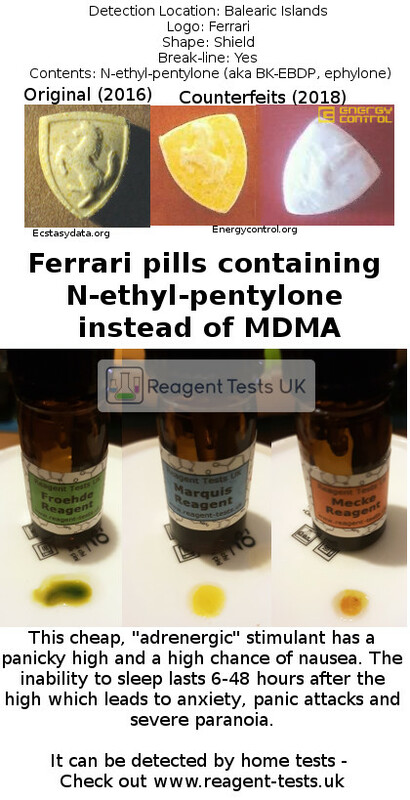 N-ethyl-pentylone can be detected at home using reagent tests, it is very easy to tell apart from MDMA because instead of going black it goes yellow/green, orange and yellow with the reagents in the MDMA testing multipack. Next post: Is it actually possible to have an ecstasy tablet which contains MDMA, cocaine and ketamine?